*There is tremendous economic potential in load shifting. 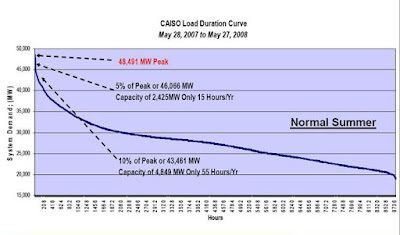 * The peak 2008 demand in California was 48,491 Megawatts. * 5% of the peak or 2,425 MW was only used for 15 hours of the year. At $2000/kW the capital cost of this capability was $4.8 billion. * 10% of the peak or 4,849 MW was only used for 55 hours of the year. At $500/kW the capital cost of this capability was $9.6 billion. A utility or system operator remotely shuts down or cycles a customer’s electrical equipment on short notice to address system or local reliability contingencies. In exchange, the customer receives an incentive payment or bill credit.